Couldn't fit all this in 140 characters, so here's my "application" to be the most #Elite member of BYU Sports Nation! 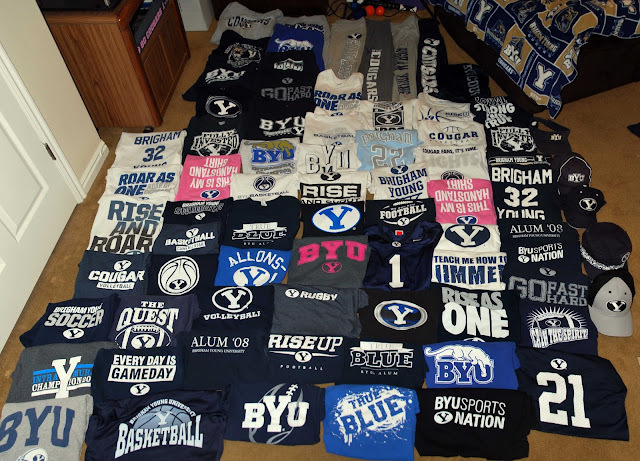 First, this is a sampling of the BYU clothing I own. I counted 65 shirts, 5 pants / shorts, and 5 hats. And I'm pretty sure this isn't all of it . . .
Second, this is what my apartment looks like. Bedroom wall #2, complete with "Jimmer shrine"
Bedroom wall #3. Most of the posters in my bedroom are autographed and laminated. If that wasn't enough, this is what my former apartment looked like during Jimmer's senior year, before my landlord made me take it all down. Each of the large posters is over 4 feet tall. Last but not least, the lifesize Jimmer. 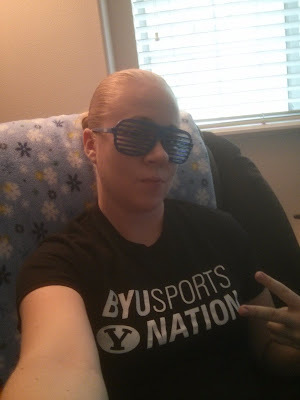 My name is Tasha, and I approve this message.